Six alumni, family, and friends helped Partners in Housing get some much-needed cleaning out of storage areas Sunday afternoon. Volunteers cleared out storage areas in preparation for rehab at Linwood Manor Apartments, a facility serving veterans battling substance abuse and/or homelessness. First, volunteers cleared a room in the basement of one of the apartment buildings at Linwood Manor. Partners had used the room for storage of old doors and other hardware, but it has plans to transform the space into a community room for residents. Once the basement was clear, the crew relocated to a line of garage-like storage units in which Partners stores unused office furniture, appliances, and miscellany. Bill Payton, Maintenance and Construction Supervisor for Partners in Housing, abhors hoarding, so he asked us to move old coin-operated laundry machines out for a “junk man” to pick up. Volunteers also moved furniture and refrigerators from units belonging to Partners in Housing to one of its social services partners, which would refurbish the office furniture and use it. 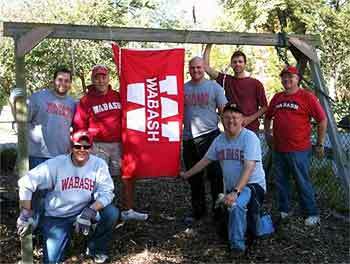 In doing so, Wabash volunteers cleared out some units that can now be used for more noble purposes.